Dimensions: 4 1/2" x 7"
This 8th edition of a best-selling book is now bigger and better than ever. It has been updated to include the hallmarks all the way up to 1999. It combines details of hallmarks found on old English silver with notes on some leading makers and useful advice for the collector - including a particularly helpful chapter on fakes and alterations as well as a new chapter on Sheffield plate. 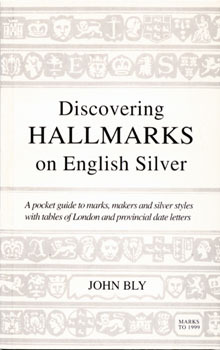 It features important sections of the development of hallmarks, collecting silver, famous makers, guide to silver styles, tables of hallmarks, and much more. Combined with the numerous detailed photographs, this excellent book makes identification easy for even the complete beginner. Conveniently sized and wholeheartedly recommended, this book will be both an intriguing and valuable read for all.